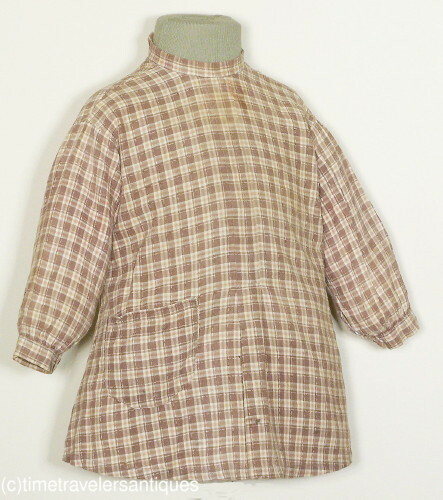 A terrific original post Civil War circa 1866 boy's brown woven plaid cotton tunic style shirt with a box pleat to the center front, one patch pocket, drop shoulders to the full sleeves, and a back China buttons closure with buttons that repeat at the cuffs, and an attached back belt. 12" from shoulder to shoulder, a loose fitting 30" chest and waist, and 18" from shoulder to front hem. 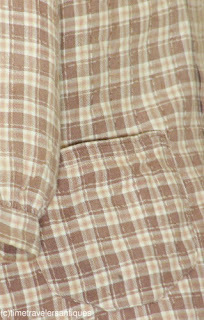 In good sound as found condition, with some organic spots below the the front of the collar and near the hem, a few pin dot to 1/4" holes at the shoulder tops on the back, and one 1 1/2" slit to the underside of one sleeve near the armscye. All is reflected in the reserve price for this rare surviving circa 1866 boy's shirt. To me, it looks more 1870's. 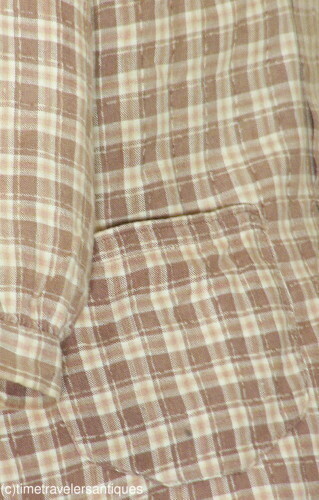 The sleeve set and the way it's cut are more natural form era type sewing techniques than what we would expect to see just after the American Civil War. 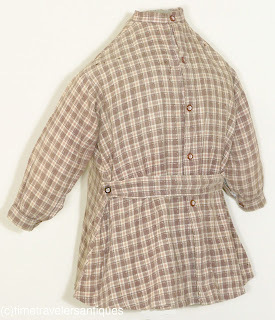 Little Boys wore dresses until they were potty trained due to not having washing machines around or plastic diaper covers.